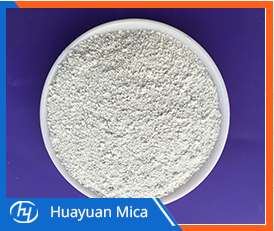 Mica is a generic name for a group of complex hydrous potassium-aluminum silicate minerals that differ somewhat in chemical composition; examples are Biotite Mica, lepidolite, Muscovite Mica, phlogopite, and vermiculite. Mica has a low coefficient of expansion, high dielectric strength, good electrical resistivity, a uniform dielectric constant, and capacitance stability; at one time it was the best electrical and thermal insulator known. The iron content determines the color. Muscovite Mica is generally gray, green, or brown; biotite, brown or black; lepidolite, pink or green; phlogopite, light brown to yellow; and vermiculite, brown. Muscovite has the greatest commercial value and is the Mica that is ground and pulverized into pigment grades. Muscovite crystals develop in booklike form with a well-developed basal cleavage that allows splitting the large books into extremely thin sheets or grinding the flakes into thin leaves to produce Dry Ground Mica. These leaves have a diameter-to-thickness ratio of more than 25 to 1--a ratio higher than that of any other flaky mineral.